“Friendships are simple but yet complex. A friend makes the world we live in a better and more poetic place. Poetry is when two people meet and friendship emerges". *Poetry can appear in the simplest moments of life. The sun shining delicately through a window, stroking your hands against the dry summer grass, a dress flickering in the summer breeze or when two people meet and a friendship occurs. These are the thoughts of creative directors Rikke Baumgarten and Helle Hestehave who have created the Spring Summer ‘19 collection based on the concept of friendship and poetry. 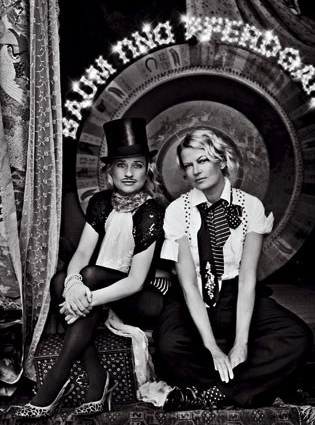 Baum und Pferdfgarten was established in 1999 by the two designers Rikke Baumgarten and Helle Hestehave. The companys headquarter is located in the heart of Copenhagen and the brand is represented in many countries worldwide. Baum und Pferdgartens characteristic is their ability and fascination of contrasts. They are good for mixing materials, colours and/or prints as never seen before, and this is what makes Baum und Pferdgartens design recognizable and unique. All prints in their collections are made in collaboration with the two designers. Over time, Baum und Pferdgarten has received numerous awards for their innovative and unique design.